4-5 Second Delay From Camera to Monitor/Screen Any Ideas? Hi all, this is my first post. I bought my PS-SE back in June and the manual etc was in Chinese as it wasn't released outside China yet. It still worked great and is stable but there is lagging about 4-5 seconds between camera and my screen. I used a Samsung Galaxy phone and had the problem so I bought a tablet with 2gb Ram and wifi/gps etc.. and only have the DJI Go App and DroneLogbook Apps on it and still the lag. I've calibrated everything and gone through as many settings as I know including lowering from 4k to 1080P on camera plus buying a SanDisk Elite Ultra 100mbps SD card. I even cleaned the cable going into gimble and switched off the video cache log and problem remains. The film taken is perfect with no lag it's just I have to fly within line of sight and be careful. The lag/delay is there when it's close or far from transmitter. It's headwrecking to be honest as I can't figure out what to do. Any idea's people? I had a p3s that did that till I signed out of the app. Removed the app and reinstalled it. It was completely fine after that. I'll try it as will do anything at this stage. Did you delete the hidden files on the SD card as well and do a complete reinstall? I've also tried changing channels but it seems you can't on the SE and also I changed from 2.4gh to 5.8gh but when I connected the quad it had changed back to the 2.4gh channel. It also seems to be set on "Follow Me" instead of FPV but again it doesn't change that 5 second delay. So annoying. Hello mate, i have the same problem.... have you found a solution? Hi, I also just bought the P3SE, took it for a TestFlight today and also experienced a enormous delay. It would even disconnect from time to time. I have a Iphone 6s. Any ideas on what the problem could be? I bought a P3SE a few weeks ago and have this problem as well, I'm using an iPhone 6s. 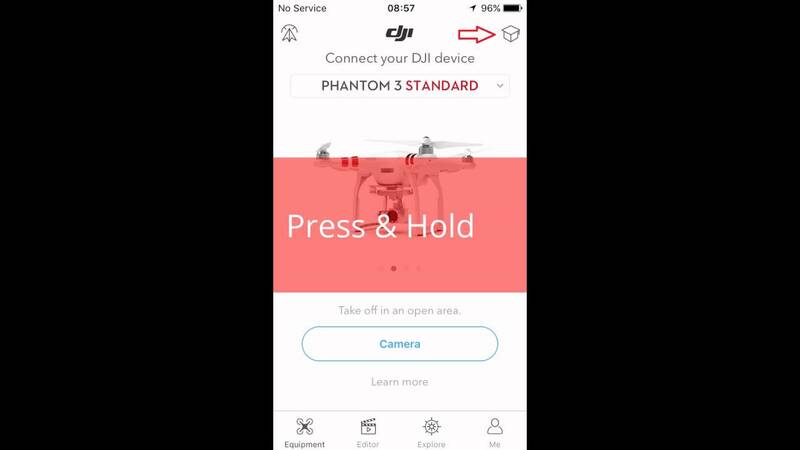 Ya delete and reinstall dji go and turn off you arplain settings amd there will be no lag I helped me out with mine (2miles 1/4mile 37feet ) wifi video feed after reinstalled. Cool, thanks. Weather has been crap for a week, but it's improving so I should be able to test it out today! But if you turn on airplane mode on your iphone, won’t you lose video signal?? I'm connected to WiFi in my home right now and just enabled Airplane Mode.. My WiFi stays connected, but cellular turns off. Hi sorry for taking ages to reply. I'm surprised that ye are having lag problems with Apple phones. On my Android 6 tablet I did a factory reset and then went into settings on quad and switched off the video cache and set my camera from 2K to 1080P 50fps which is more than enough as I'm not shooting a Hollywood movie. I just installed DJI Go App, Dronelogbook and Google Maps. I switched off all unnecessary backround processes and it worked, no lag!! I went off to do a test flight and I noticed there was no map showing in the DJI App when I started it and was trying to set the "Return to home". I had data turned off on tablet and switched it back on and Google maps updated and guess what?? The lag was back. I wouldn't mind a second but 4-5 seconds is dangerous. I'm at witts end to be honest. I spoke to DJI and said if they lowered the price of CrystalSky to around $200-250 that a lot more people would buy it including me. Who's going to pay $650 for just a monitor when you can buy an iPad that can fly the quad as well as do other things. I'm very close to selling the Phantom even though I do love it but for $250 you can buy a 4K UpAir drone with 1km control and has a free MONITOR!! I get all sorts of problems like that with my Galaxy tablet and seems to get worse. I've done a factory wipe of the tablet but that didn't help. I think they put too much in the app, along with updates the tablet itself calls for. I may try downgrading the tablet to what it had when it was released to market which I think had Android 5.1, or a generic firmware with no bloatware. It was an inexpensive refurb tablet. I uninstalled the DJI app, then reinstalled it. Then I turned on Airplane Mode on my phone which turns off cellular service, and Apple maps, but I still get a little compass box which is all I really need since I don’t let the drone get out of my line of sight. This method works for me and I’m not getting any video lag at all. I solved the problem with the "Gimbal Disconnected" showing which DJI admitted is a firmware 3.1.18 error which they said they'll fix in "next" so called UPgrade and the lag problem. I searched for an older APK firmware as DJI has disabled the firmware rollback/downgrade on the App. I found a site with clean APK versions https://www.apk4fun.com/history/96377/ and downloaded DJI GO APK 3.1.10 using APK installer App APK Installer - Android Apps on Google Play on my tablet. I then switched off notifications on the DJIGO App and changed setting on Google Play from install upgrades to "Let me decide" and IT WORKS!! No error messages though you are asked upgrade available so just click X. For lag issues I switched off video cache and lowered my settings from 4k to 1080P at 50FPS and it's working perfectly with no lag!!! I'm seriously thinking of selling my Phantom even though I do love it but there are far too many rushed firmware upgrades. DJI should do less upgrades and test them thoroughly before unleashing them on us as I have crashed a new tablet I bought just for the DJI App as went deep into settings in tablet to try and correct an error which crashed my tablet and I find out it was DJI software/firmware was the problem and not my tablet. I can't send tablet back as it wasn't the makers of the tablet's fault. Is DJI going to reimburse me $120? If I was using my drone for work like mountain rescue or security then I wouldn't have been able to use it due to constant firmware problems plus also it's dangerous to fly it with these errors as could crash and injure or kill someone.. Why don't they make more money and keep customers happy by lowering the price of the DJI SkyCrystal to $200 as I would buy and I'm sure 1,000's of others and we would then all be "on the same page" so to speak meaning no more multiple issues with different devices. It makes sense!! You seem to know a lot about the drones hardware and software.